What did the boy elephant say to the girl elephant on Valentine’s Day? What did the boy bat say to the girl bat on Valentine’s Day? A. You’re fun to hang around with! A. I’m nuts about you! A. You’re nuts so bad yourself! What did the boy rabbit say to the girl rabbit on Valentine’s Day? What did the girl bee say to the boy bee on Valentine’s Day? What did the boy whale say to the girl whale on Valentine’s Day? What did the buck say to the doe on Valentine’s Day? What did the girl sheep say to the boy sheep on Valentine’s Day? A. You’re not so baaaaaa-d yourself! A. I’m stuck on you. A. Because it couldn’t get a date. A. You get buttered up. Q. What is the difference between a girl who is sick of her boyfriend and a sailor who falls into the ocean? A. One is bored over a man the other is a man overboard. A. No, but they had an apple. A. I find you very attractive. A. You’re fun to hang around with. A. I love you a whole watt! A. I’m sweet on you! Q. Did you hear about the nearsighted porcupine? A. He fell in love with a pin cushion! A. I dot my i’s on you! A. Sure, they’re very scent-imental! 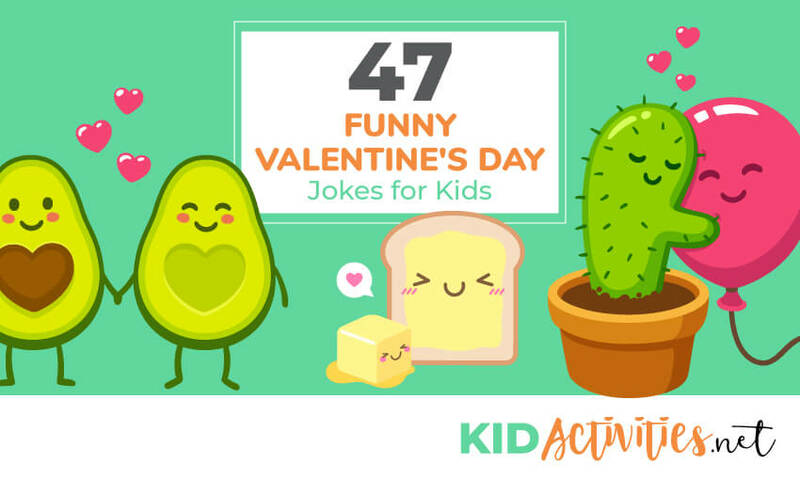 There you have it, 47 funny Valentines day jokes for kids. We hope you have enjoyed them and be sure to check out our list of the best trivia board games as well.